Any machine that flies in the air, be it an aeroplane, helicopter, fighter jet or a transport plane, it captures the imagination of kids. Be it a small boy or a girl, they are just amazed by these machines (well, most of us grown ups are too, in spite of how many every times we fly in them)! No wonder that quite a few birthday cakes are for air planes. Here is one that we at warmoven recently baked. A beautiful white plane flying in the blue sky with a few white fluffy clouds, with a big banner wishing happy birthday to the birthday boy! Was an absolute high flyer at the party! 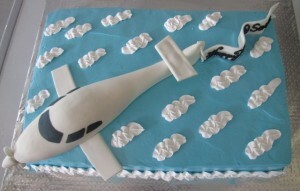 Depending on your choice, we can decorate the plane further like a Disney plane or an airforce jet. Total min weight is 3 kg, available in flavor of your choice. Delivery free anywhere in Bengaluru.